Sir Muhammad Iqbal(9 November 1877 – 21 April 1938), widely known as Allama Iqbal, was an academic, poet, barrister, philosopher, and politician in British India who is widely regarded as having inspired the Pakistan Movement. He is considered one of the most important figures in Urdu literature, with literary work in both the Urdu and Persian languages. 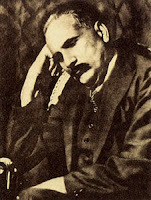 Iqbal is admired as a prominent classical poet by Iranian, Pakistani, Indian, Bangladeshi, Sri Lankan and other international scholars of literature. Though Iqbal is best known as an eminent poet, he is also a highly acclaimed "Muslim philosophical thinker of modern times". His first poetry book, Asrar-e-Khudi, appeared in the Persian language in 1915, and other books of poetry include Rumuz-i-Bekhudi, Payam-i-Mashriq and Zabur-i-Ajam. Amongst these his best known Urdu works are Bang-i-Dara, Bal-i-Jibril, Zarb-i Kalim and a part of Armughan-e-Hijaz. In Iran and Afghanistan, he is famous as Iqbāl-e Lāhorī (Iqbal of Lahore), and his poetry enjoys immense popularity among the masses, as well as strong support from ideologues of the Iranian Revolution. Along with his Urdu and Persian poetry, his various Urdu and English lectures and letters have been very influential in cultural, social, religious and political disputes over the years. In 1922, he was knighted by King George V, giving him the title "Sir". 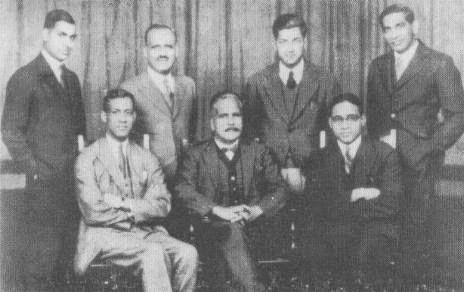 While studying law and philosophy in England, Iqbal became a member of the London branch of the All-India Muslim League. Later, in one of his most famous speeches, Iqbal pushed for the creation of a Muslim state in Northwest India. This took place in his presidential speech in the League's December 1930 session. In much of Southern Asia and Urdu speaking world, Iqbal is regarded as the Shair-e-Mashriq. He is also called Mufakkir-e-Pakistan and Hakeem-ul-Ummat . The Pakistan government officially named him a "national poet". In India he is also remembered as the author of the popular song Saare Jahaan Se Achcha. Iqbal was born in Sialkot on 9 November 1877 within the Punjab Province of British India (now in Pakistan). His grandparents were Kashmiri Pandits, the Brahmins of the Sapru clan from Kashmir who converted to Islam. In the 19th century, when Sikhs were taking over rule of Kashmir, his grandfather's family migrated to Punjab. Iqbal often mentioned and commemorated about his Kashmiri Pandit Brahmin lineage in his writings. Iqbal's father, Sheikh Noor Muhammad, was a tailor, not formally educated but a religious man. Iqbal's mother Imam Bibi was a polite and humble woman who helped the poor and solved the problems of neighbours. She died on 9 November 1914 in Sialkot. Iqbal loved his mother, and on her death he expressed his feelings of pathos in a poetic form elegy. Iqbal was four years old when he was admitted to the mosque for learning the Qur'an, he learned the Arabic language from his teacher Syed Mir Hassan, the head of the madrassa and professor of Arabic language at Scotch Mission College in Sialkot, where Iqbal completed matriculation in 1893. He received Intermediate with the Faculty of Arts diploma from Murray College Sialkot in 1895. The same year he enrolled Government College Lahore where he qualified for Bachelor of Arts in philosophy, English literature and Arabic as his subjects from Government College Lahore in 1897, and won the Khan Bahadurddin F.S. Jalaluddin medal as he took higher numbers in Arabic class. In 1899, he received Masters of Arts degree from the same college and had the first place in Punjab University, Lahore. Iqbal had married three times, in 1895 while studying Bachelor of Arts he had his first marriage with Karim Bibi, the daughter of a Gujarati physician Khan Bahadur Ata Muhammad Khan, through an arranged marriage. They had daughter Miraj Begum and son Aftab Iqbal. Later Iqbal's second marriage was with Sardar Begum mother of Javid Iqbal and third marriage with Mukhtar Begum in December 1914. Iqbal was influenced by the teachings of Sir Thomas Arnold, his philosophy teacher at Government college Lahore, Arnold's teachings determined Iqbal to pursue higher education in the West. In 1905, he travelled to England for his higher education. Iqbal qualified for a scholarship from Trinity College, University of Cambridge and obtained Bachelor of Arts in 1906, and in the same year he was called to the bar as a barrister from Lincoln's Inn. In 1907, Iqbal moved to Germany to study doctorate and earned Doctor of Philosophy degree from the Ludwig Maximilian University, Munich in 1908. Working under the guidance of Friedrich Hommel, Iqbal published his doctoral thesis in 1908 entitled: The Development of Metaphysics in Persia. During Iqbal's stay in Heidelberg, Germany in 1907 his German teacher Emma Wegenast taught him about Goethe's Faust, Heine and Nietzsche. During his study in Europe, Iqbal began to write poetry in Persian. He prioritized it because he believed he had found an easy way to express his thoughts. He would write continuously in Persian throughout his life. Iqbal, after completing his Master of Arts degree in 1899, initiated his career as a reader of Arabic at Oriental College and shortly was selected as a junior professor of philosophy at Government College Lahore, where he had also been a student, and worked there until he left for England in 1905. In 1908, Iqbal returned from England and joined the same college again as a professor of philosophy and English literature. At the same period Iqbal began practicing law at Chief Court Lahore, but soon Iqbal quit law practice, and devoted himself in literary works and became an active member of Anjuman-e-Himayat-e-Islam. In 1919, he became the general secretary of the same organisation. Iqbal's thoughts in his work primarily focus on the spiritual direction and development of human society, centered around experiences from his travels and stays in Western Europe and the Middle East. He was profoundly influenced by Western philosophers such as Friedrich Nietzsche, Henri Bergson and Goethe. The poetry and philosophy of Mawlana Rumi bore the deepest influence on Iqbal's mind. Deeply grounded in religion since childhood, Iqbal began intensely concentrating on the study of Islam, the culture and history of Islamic civilization and its political future, while embracing Rumi as "his guide". Iqbal would feature Rumi in the role of guide in many of his poems. Iqbal's works focus on reminding his readers of the past glories of Islamic civilization, and delivering the message of a pure, spiritual focus on Islam as a source for sociopolitical liberation and greatness. Iqbal denounced political divisions within and amongst Muslim nations, and frequently alluded to and spoke in terms of the global Muslim community or the Ummah. Iqbal is commemorated widely in Pakistan, where he is regarded as the ideological founder of the state. His Tarana-e-Hind is a song that is widely used in India as a patriotic song speaking of communal harmony. His birthday is annually commemorated in Pakistan as Iqbal Day, a national holiday. 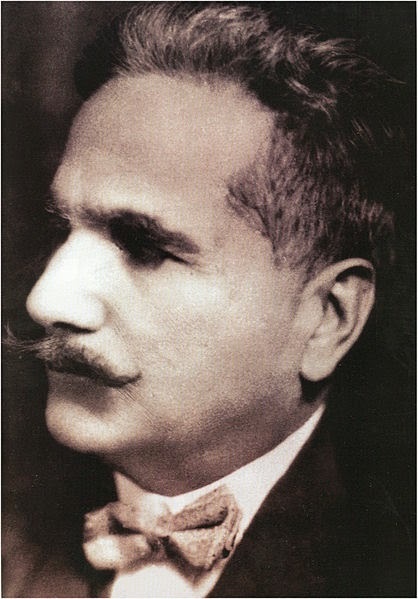 Iqbal is the namesake of many public institutions, including the Allama Iqbal Campus Punjab University in Lahore, the Allama Iqbal Medical College in Lahore, Iqbal Stadium in Faisalabad, Allama Iqbal Open University in Pakistan, the Allama Iqbal International Airport in Lahore, the Allama Iqbal hall in Nishtar Medical College in Multan and Gulshan-e-Iqbal Town in Karachi and Allama Iqbal Hall at AMU, India. The government and public organizations have sponsored the establishment of educational institutions, colleges and schools dedicated to Iqbal, and have established the Iqbal Academy Pakistan to research, teach and preserve the works, literature and philosophy of Iqbal. Allama Iqbal Stamps Society established for the promotion of Iqbaliyat in philately and in other hobbies. His son Javid Iqbal has served as a justice on the Supreme Court of Pakistan. Javaid Manzil was the last residence of Allama Iqbal.